Texas businessman David Hicks is on the front lines of creating a smart community—using technology to improve the quality of life in his hometown of Allen, Texas. Hicks owns the David Hicks Company, a commercial real estate brokerage and development services firm in Allen. He was a driving force behind a campaign to pass a $272 million school bond measure, commissioning the creation of a story map created with Esri technology that explained to voters the rationale for passing a school bond measure and what construction projects would be funded. 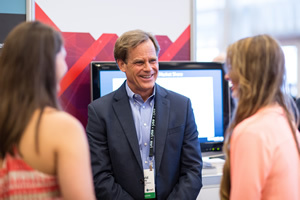 Businessman David Hicks, who attended the Esri Business Summit in 2015, uses ArcGIS to help him make business decisions and to support schools in Allen, Texas. When citizens don't have access to information, they tend to be more critical of government decisions. Providing information helps all parties operate from a common base of understanding grounded in fact, and it creates the transparency that citizens today are requesting. The David Hicks Company uses Esri ArcGIS, which he says has made his firm very successful at competing for business in the Dallas area commercial real estate market. Hicks wants that same technology to be used by students in the Allen schools. Hicks is actively involved in coordinating a GIS program for the new science, technology, math, and engineering (STEM) center at Allen High School. He intends to use his knowledge about ArcGIS and work with the school district to help staff adopt Esri technology through the Esri ConnectED program that's part of the White House's ConnectED initiative. Esri provides free ArcGIS Online accounts to kindergarten through 12th grade schools in the United States. Besides creating a story map that influenced a historic local election (the school bond measure overwhelmingly passed last November) Hicks has successfully brokered a client's 16-acre land donation to the Allen Independent School District. The donation will be used for the STEM center. After working with successful national and international firms for the first 22 years of his career, Hicks opened his own small commercial real estate brokerage and development consulting firm in Allen. His four person company generates an annual sales volume of approximately $50 million. Eighteen months ago, Hicks adopted the Esri ArcGIS platform to enhance his company's research and marketing. With the expertise of Datastory Consulting, the technology is applied across most aspects of his business. Location analytics drives better decisions for clients who lease or buy real estate, and interactive maps on the company's website simplify access to the information needed to evaluate specific sites for clients. Leveraging geographic knowledge has helped Hicks maximize his group's time to compete with larger organizations and better serve customers. Now Hicks uses story maps daily in his business. "Freeing myself from spending time in research and presentation preparation gives me the time to focus on customer and client relationship building and actual transaction negotiation," said Hicks. "This way, our small firm can provide a level of service previously only available from much larger companies."